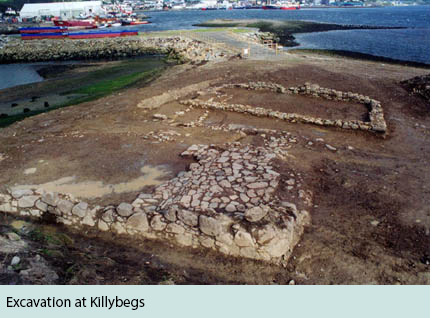 The excavation of this site was carried out by AEGIS ARCHAEOLOGY in advance of a major pier development, and resulted in the excavation of five stone structures, which appear to be the remains ofpart of the original plantation settlement of Killybegs, and date from the early part of the 17th century. The excavation was concentrated on a small island known as Rough Point, which measured approximately 80m east west by 60.0m north south. The houses were in varying states of repair, constructed of undressed stone and bonded with a mixture of earth and clay. As interesting aspect of this excavation is that while all the houses or structures are similar in size, no two structures are exactly the same. A variety of floor plan was used, some houses having internal divisions, some had flagged floors, while even the design of fireplaces differed significantly from house to house. Pottery sherds recovered from the site also suggest that this small community was active during the 17th century. This site does not appear to have continued in use beyond the early part of the 18th century. The settlement appears to have been abandoned, and the largest of the houses exhibited evidence of having been burnt down. Post excavation work is currently taking place. The excavation was funded by the Department of the Marine and Natural Resources. This site is published as an Aegis Archaeology Monograph No. 2 (2004) and was supported by the Dept of the Marine and Natural Resources; see publications section.